Pine Log Mountain is located in the U.S state of Georgia with a summit elevation of 2,338 feet (713 m). The peak is three miles west of the town of Waleska separated only by the gated community of Lake Arrowhead. The summit falls within Cherokee County, although the majority of the mountain range trails into Bartow County including other peaks of Little Pine Log Mountain, Bear Mountain and Hanging Mountain. Pine Log and these other summits within its range are the last mountains over 2,000 feet (600 m) in the Appalachians of north Georgia. The Appalachian range does not rise above 2,000 feet again until many miles further southwest in the Talladega National Forest in Alabama. The majority of the Pine Log Mountain range falls within a wildlife management area, although the peak is excluded slightly to the east. The actual summit houses a radio tower. The land is owned by a paper company who leases the property to the state for proper management. This allows for a wide range of multi-use; mountain biking, birding, fishing, hiking and hunting are some of the popular activities enjoyed in the area. There are also several hiking trails on surrounding peaks that offer views of the Pine Log Ridge. It is also believed that Pine Log may have been mined for iron as was Red Top Mountain State Park to the south. 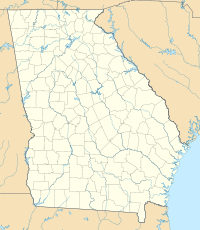 Pine Log lies within the exurban reaches of Atlanta’s metropolitan area. The sprawling urban landscape of the city makes this wilderness a refuge for wildlife. Currently, its conservation is significant as a state-managed habitat roughly at 14,054 acres (56.87 km2). Although the peak is just outside protected boundaries, it is the second-highest point in metro Atlanta, behind adjacent Bear Mountain. The county seat of Bartow, Cartersville, claims Vineyard and Pine mountains, which are protected and offer views of Pine Log to the north. The Etowah River flows through these peaks and upstream forms Lake Allatoona. ^ a b "Pine Log Reset". NGS data sheet. U.S. National Geodetic Survey. Retrieved 2011-08-08. ^ "Pine Log Mountain". ListsOfJohn.com. Retrieved 2011-08-08. ^ "Hiking and Geocacheing". Cartersville – Bartow County Convention and Visitors Bureau. Retrieved 2011-08-08. ^ Sugar Hill. Etowah Valley Historical Society. Retrieved 30 August 2015. ^ McCallie, Samuel. A Preliminary Report on a Part of the Iron Ores of Georgia: Polk, Bartow and Floyd Counties (1900), pp. 156-157. "Pine Log Mountain". Geographic Names Information System. United States Geological Survey. "Pine Log Mountain, Georgia". Peakbagger.com. "Pine Log WMA Trip". PBase. "Pine Log Creek Trail". Campnpost.com.